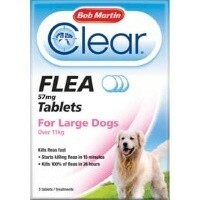 Bob Martin Clear Flea Tablets for Large Dogs are an extremely fast and effective way for the elimination of fleas on your large dog. Killing 100% of fleas in 24 hours, this fast action treatment begins work in 15 minutes after first administration, relieving irritation straight away! To be used instead of a spray or shampoo, it is recommended to administer a second tablet the following day, or follow up treatment with a Bob Martin Spot On. Suitable for large dogs over 11Kg in weight.